Charm City Traveler: New York to Hawaii for $482! 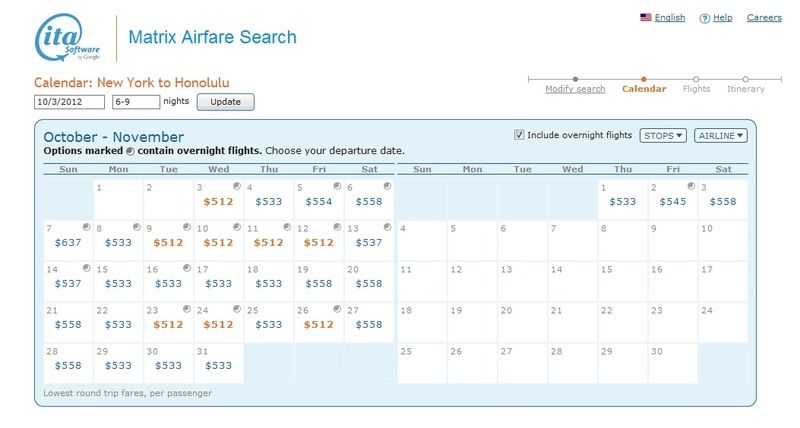 I'm trying to spread the love on great flight deals, but Hawaii just keeps rearing its ugly awesomely tropical head. 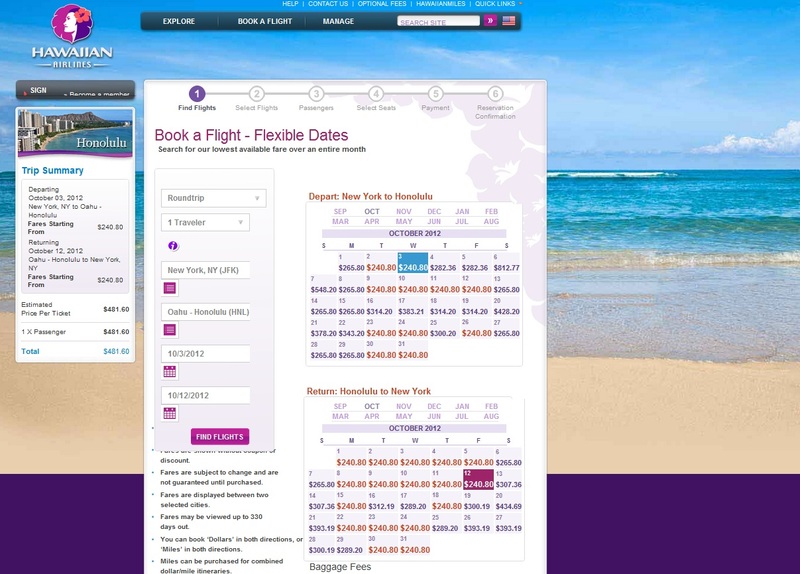 Via The Flight Deal, Hawaiian Airlines is offering round trip tickets between New York-JFK and Honolulu for under $500. 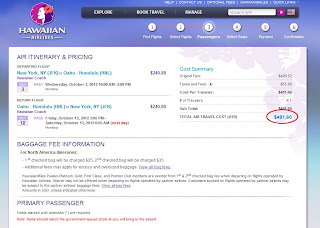 Travel must be booked by September 18th and travel is valid until December 14th. The ultra discounted flights appear to be only for Monday-Friday flights, but when you are taking a week long vacation, who cares which day you leave and come back? $512 Is Incredible But We Can Do Better! I love using the ITA Software matrix to find the lowest fares online between city pairs, but even this tool isn't properly displaying the great price. Initially, ITA is pricing out the roundtrips at $512. 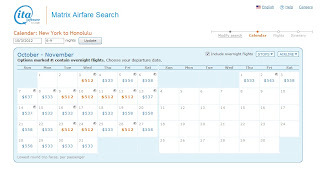 However, by going directly to the Hawaiin Airlines website, you can play around with the calendar and find fares as low as $482 including taxes and fees! One of the most appealing parts of this fare (apart from the eye-popping price) is that these flights are non-stop. Instead of connecting twice, which is often the case for flights to Hawaii from the East Coast, you will arrive straight to Oahu. This really helps minimize your travel time and hassles. 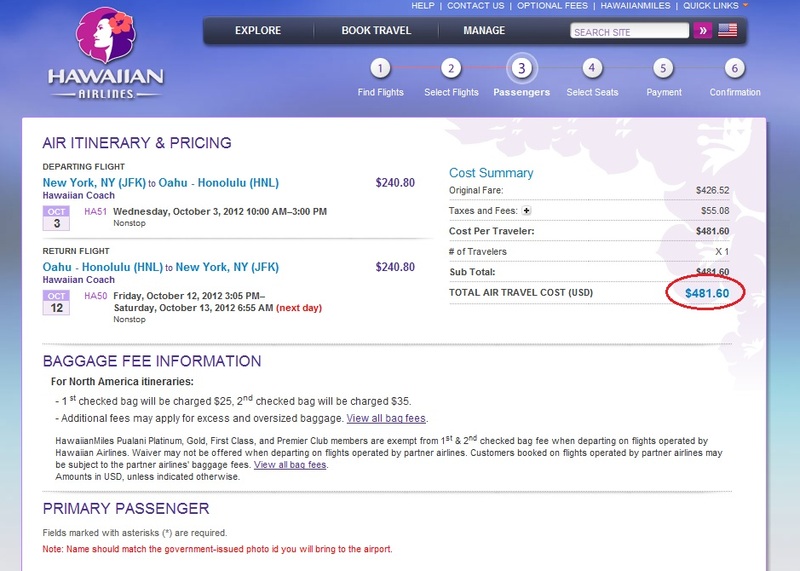 Those of us in Philadelphia, Boston, Baltimore, and Washington D.C. shouldn't dismiss this fare at all. There are lots of connections to both LaGuardia and JFK offered by United, Jet Blue, American, U.S. Airways, and Delta in these cities. Just be careful to leave yourself PLENTY of time between the two flights, as airlines will not rebook you due to weather or other unforeseen circumstance if you are traveling on separate tickets. Heck, even a Mega Bus trip isn't out of the question. The bottom line is that you should act fast on this. Tickets will be snatched up quickly, I'm sure. Keep in mind that Hawaiian allows a 24-hour fee-free cancellation for any reasons, so speculative bookings (before you check with your significant other or friends) are highly encouraged. Happy bookings, everyone! Until tomorrow.